Stems: Erect, branched near base and above, sparsely hairy; branches up to 24 inches long. Leaves: Alternate, stalked, pale or dull green, circular in outline, 1 to 2.5 inches wide, deeply palmately-divided into 5-9 lobes; lobes cleft or parted; lobe tips blunt. Inflorescences: Flowers usually in pairs, pairs grouped into loose clusters in upper leaf axils. Flowers: Small, 1/3 to 1/2 inch across; sepals 5, overlapping, narrowly to broadly ovate, 3-5-nerved, hairy, bristle-tipped; petals 5, about equaling sepals, overlapping, white or pink, tips rounded to blunt; stamens 10. Fruits: Capsules, slender, 1 to 2 inches long, hairy, with 5 1-seeded cavities at base, prominent column topped by 5 short beaks; seeds oblong, dark brown. Habitat: Dry waste areas, fields, prairies, pastures, lawns, and roadsides; various soil types. Origin: Native to North America. 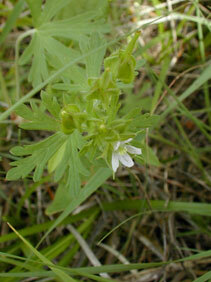 Comments: Carolina cranesbill is a somewhat weedy species that reproduces via seeds.